AI Powered HR Chatbot - 24x7 AI Assistant for Employees ! If you are already not considering an AI Powered HR Chatbot for your organisation, you must be getting behind everyday, in building the next generation processes to drive people productivity. 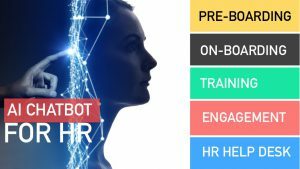 HR Chatbot can be a great first step towards preparing your organisation for the A.I Revolution by making all your employees experience the power of AI. Organizations and people using AI will have extraordinary and unfair advantage over the ones not using it or not using it effectively. AI will create extraordinary capabilities for people and organizations, augmenting their performance exponentially . “The threat is not that AI will replace people and create unemployment. The real threat is, people not using AI will be replaced by people using AI. Intelligent machines are redefining the way we work. “Intelligent machines will free up all the time for us, from most of the logical and repetitive tasks requiring no human intelligence. So that, the human mind can focus on creation, innovation, empathy, sympathy, purpose, passion, dream, life and all that machines can’t do”. As the world moves from mobile first to AI first, most of the top companies that lead technology and best practices are betting on AI to drive exponential business gains in near to medium term. Gartner predicts that, “By 2019 integrated virtual employee assistants will increase the productivity by 10%”. To really understand how AI powered HR Chatbots are going to redefine the Future of Work, we must first understand the basic principles. The term BOT is derived from the word ROBOT. Software applications that are capable of doing logical and repeatable tasks without any human intervention are called BOTs. When these BOTs operate with an intelligence of understanding natural language (NLP) and can carry out human like conversations with a chat interface, these are called Chatbots. BOTs that can learn on their own in the defined domains, based on self-learning Machine Learning algorithms, are called AI BOTs. Now, because these AI BOTs can understand human language and learn certain skills over time with appropriate training, they can do most of the repetitive tasks with far better precision and efficiency than human beings. Its important to understand what is HR Chatbot. The intelligence of an HR Chatbot and the use cases addressed by it can be very different, depending on the domain and technology competency of the team creating it. Simple chatbots can be made with almost no effort and even FREE of cost on chatbot building platform. However, making an intelligent Chatbot with machine learning capabilities for handling complex user interactions and tasks require extremely high level of domain expertise in HR and technology competency in AI. Such advanced systems keep evolving and learning over period of time and keep building new use cases based on user interaction and business priorities. So, HR Chatbot can be just a basic and generic good to have new technology fad with no real impact on business, or an extremely powerful technology intervention that can redefine employee productivity and engagement. ‘MooN’ is the ‘Smartest’ HR Chatbot ! Imagine, if each person has a dedicated Personal Assistant and Coach who understands their level of skill, knowledge, performance and motivation. And helps them with all the in-put and support to do better, and be better everyday. Meet the first Enterprise AI Assistant ‘MooN’, the smartest AI powered HR Chatbot !! ‘MooN’ can simultaneously Assist, Coach and Engage with 1000s of people across Functions and Roles. Induction of a new team member, feeding him/her with basic business and functional knowledge, understanding performance and skill gaps, coaching, training, engagement, and all the day to day queries and administrative support, Moon does it all !! How A.I will Augment and Scale Human Capabilities ! This power, unleashed by Intelligent Machines will exponentially augment human capabilities and redefine the way we interact, engage and work. To understand it in simpler ways, with huge advancement in AI in the recent years, it is possible to digitize domain specific knowledge and expertise and create intelligent machines that can replicate this at almost a limitless scale with absolute consistency. AI adds cognitive power to the computing and scaling power of the machines. This synergy between the human brain and machine can exponentially augment our capability in any domain. AI enhances our capabilities many ways. By reducing or eliminating the time and effort we spend on doing logical and repeatable tasks, allowing us more time to focus on thinking, imagination and innovation. By enhancing our ability to understand complex situations and predicting behavior or outcome, giving us an opportunity to act upon for better outcomes. By recommending the most efficient solution and direction based on learnings of past event or data. A relatable example in HR could be in the area of people Hiring and Development. Hiring right people and Developing them to perform better, are the two most important capabilities for an organization and skill for leaders at an individual level. Artificial Intelligence based systems trained with the best possible data and domain expertise can perform these functions like an expert with a consistency and scale that is humanly not possible. 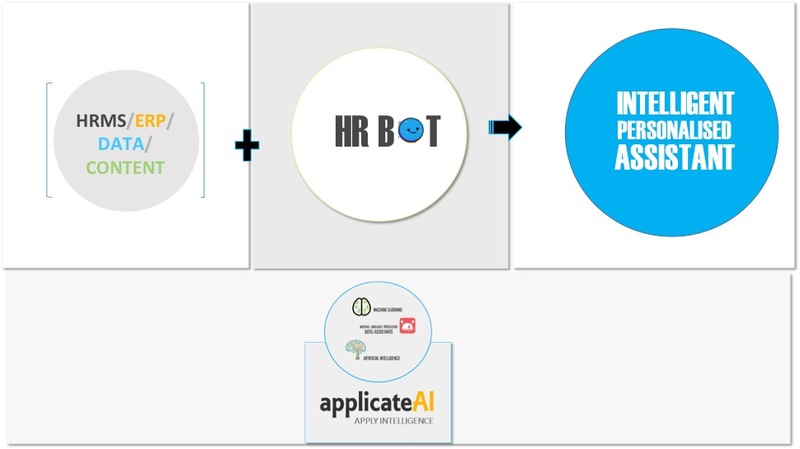 How an AI powered HR BOT can assist the entire Organization !! HR Chatbots with conversational interface give a completely different user experience with personalized and user specific in-put and support at their command. According to a recent survey of 350 HR leaders conducted by ServiceNow, 92% HR leaders agree that the future of providing an enhanced level of employee service will include chatbots. 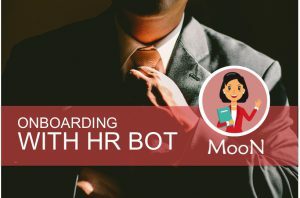 How an Enterprise HR BOT works? With 24×7 real-time interaction, one on one personalized engagement and super human-like intelligence, a customized ‘HR BOT’ for your entire organization can revolutionize employees skill, productivity and engagement. ‘MooN’ is a first of its kind AI and Machine Learning powered ‘HR BOT’ that works like an Enterprise AI Assistant. ‘Moon’ is helping companies engage and support 100s and 1000s of their employees simultaneously. ‘Moon’ consumes data, information, and content from your existing ERP, CRM or HRMS and converts it into Actions, Insights, and Answers of the queries with a Conversational interface. An AI Powered HR Chatbot can do a host of repetitive and logical tasks with human like cognitive abilities including the following. Skill Gap Identification and Training. Real-time data and content on demand with conversational experience. Administrative Support on day to day queries. 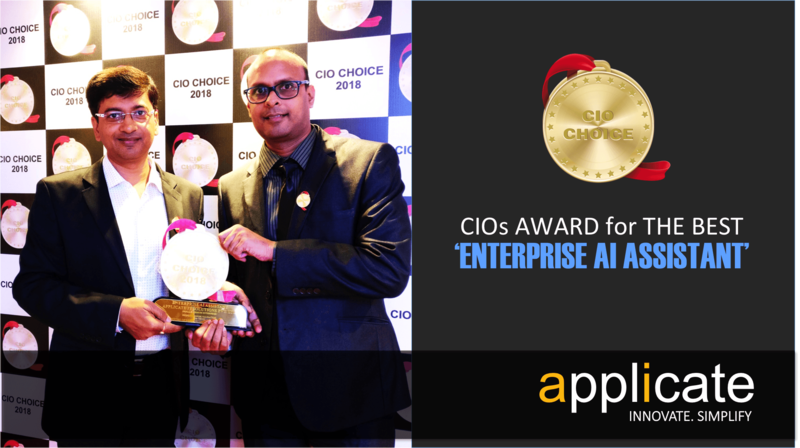 When is the Right Time for Organizations to adopt AI based solutions !! This is the most important question to be answered by the HR leaders and Organizations. Most of the organizations leading industry best practices and technology know that the right time to adopt any technology is when others are still figuring it out. Technology, Process and the related capabilities mature only with iterative efforts. Finally the company that leads advancement of technology and best practices are the ones that start early and invest time, effort and resources behind it over a period of time to reap the benefits. AI is a Future Defining Technology. It is not about buying the best solution when you are ready and start using it. At this stage, AI as a technology has reached a tipping point in terms its capabilities to significantly impact current processes and solve many unsolved problems. But, most of the Businesses and Business Leaders are still not sure how to use AI !! 39% of decision makers are not sure what AI can be used for. 42% are not adopting AI coz there is no defined business case. So, AI must be seen as a Future Defining Opportunity for the Organizations and leaders with a vision to lead the new order in the ‘AI First World’ where the incumbent would be the master of using this technology for extraordinary competitive advantages. The first expected outcome of AI-based solutions is to make things easier, simpler, efficient, effortless and eventually almost magical. So, any area where you have a challenge or an opportunity which can significantly impact your efficiency or competitive advantage, learn to apply AI with the right technology partners. The initial solution might or might not be appear to be giving a significant advantage, but eventually the continued incremental progress will lead to an exponential and extraordinary progress over a period of time. Do ‘PILOTs’, test hypothesis to work and re-work solutions with the end goal in mind. The journey might not be exciting but the destination definitely will surprise you. Invest significant amount of time, resources and capital in AI as building blocks for creating organizational awareness, literacy and capability to use AI for inventing the Future.